The food turned out amazingly well. 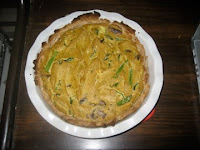 It was my first time making quiche without eggs. I had no idea what to expect, or if it would be any good at all, but it turned out pretty well. I liked it the second time around with the baked beans on top. Otherwise, the flavor of the nutritional yeast was a bit overpowering for my tastebuds. 1. Sift together the flour, salt, sugar, and baking powder. Using a fork (or your fingers), cut the coconut oil into the flour to form a coarse meal. Add the water slowly until the dough comes together. 2. Roll out the dough and fit into a 9" pie plate. 3. Weight the bottom of the piecrust with dried beans or uncooked rice, and bake for 10-12 minutes, until golden. Remove from the oven, remove the weights, and set the crust aside to cool. Turn down the oven temp. to 350'. 1. Crumble the tofu into the bowl of a food processor (or blender) and process until smooth. Add the nutritional yeast, tamari/soy sauce, miso, thyme, basil, salt, pepper, and dry mustard, and blend well. Transfer to a medium-size bowl and set aside. 2. In a saute pan, heat the oil, add the onion and garlic, and saute until soft. Add the fresh vegetables and saute, stirring until soft. 3. Add the sauteed vegetables to the tofu mixture and stir until combined. 4. Pour the filling into the prebaked crust and bake for 20-25 minutes, until golden brown. I made this one up on my own, so I don't have anything dyed in the wool for measurements. 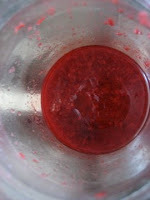 I used about 2 c. washed and cut strawberries, 1 c. cherries (pitted and cut in half) and probably 1/2 c. sugar. I brought this mixture to a boil on medium-high heat, then simmered for quite a while (10 minutes?) while I worked on the other dishes. It might be a little tart for some tastes, but I appreciated not having a saccharin-sweet topping for my bread. To make the bread, I simply cut a half loaf of a French baguette into slices about 1.25" thick, then stuck a little bit of Earth Balance butter in between each slice and wrapped it in foil. I "baked" this for 10 minutes on the warm setting on my oven, and served while warm. I made this salad with a pesto recipe from Vegan With a Vengeance, but the rest of it came from my brain. I decided that I really wanted a cold pasta salad to accompany the rest of the dishes, and I also wanted to use myriad vegetables to really have a fresh flavor. 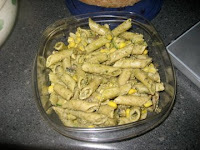 I added sauteed mushrooms, cashews, canned corn, and zucchini and used small tube pasta to make this dish complete. Combine the nuts, basil, garlic, and salt in a blender and process while you add the oil in a slow, steady stream. Add the nutritional yeast and pulse to combine. The sauce should be the consistency of a slightly grainy paste, not a puree. I mixed everything together and then cooled the dish in the fridge for about an hour before taking it to the picnic. Wow, I didn't know you could make quiche without eggs - the combination of ingredients sounds delicious. 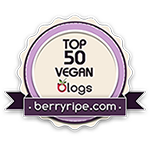 I write about green living, simplifying and plant based food on my blog too - come by and check it out if you like!